"F1 2009" redirects here. For the video game based on the 2009 Formula One season, see F1 2009 (video game). Jenson Button and Brawn GP secured the Drivers' Championship and Constructors' Championship titles respectively in the Brazilian Grand Prix, the penultimate race of the season. It was both Button and Brawn's first Championship success, Brawn becoming the first team to win the Constructors' Championship in their debut season. Button was the tenth British driver to win the championship, and following Lewis Hamilton's success in 2008 it was the first time the Championship had been won by English drivers in consecutive seasons, and the first time since Graham Hill (1968) and Jackie Stewart (1969) that consecutive championships have been won by British drivers. Also notable was the success of Red Bull Racing, as well as the poor performance of McLaren and Ferrari compared to the previous season. Ten teams participated in the Championship after several rule changes were implemented by the FIA to cut costs to try to minimise the impact of the global financial crisis. There were further changes to try to improve the on-track spectacle with the return of slick tyres, changes to aerodynamics and the introduction of Kinetic Energy Recovery Systems (KERS) presenting some of the biggest changes in Formula One regulations for several decades. The Brawn team, formed as a result of a management buyout of the Honda team, won six of the first seven races, their ability to make the most of the new regulations being a deciding factor in the Championship. The Red Bull, McLaren and Ferrari teams caught up in an unpredictable second half of the season, with the season being the first time since 2005 that all participating teams had scored World Championship points. Sebastian Vettel and Button's teammate Rubens Barrichello were his main challengers over the season, winning six races between them to finish in second and third respectively. The following teams and drivers competed in the 2009 FIA Formula One World Championship: Teams competed with tyres supplied by Bridgestone. The Chinese Grand Prix was brought forward from its October date to April to become the third round of the championship. Abu Dhabi made its first appearance on the F1 calendar under the name Abu Dhabi Grand Prix with a race being held at the Yas Marina Circuit on Yas Island in Abu Dhabi on 1 November – the final round of the 2009 season. That meant the Abu Dhabi Grand Prix was the new final round of the 2009 season, replacing the Brazilian Grand Prix as the traditional final round since 2004. The Japanese Grand Prix changed circuits from the Fuji Speedway in Oyama to the Suzuka Circuit in Suzuka. The Canadian Grand Prix and the French Grand Prix were removed from the calendar. Banned since 1998, slick tyres were re-introduced for 2009. A ban on aerodynamic appendages resulted in the 2009 cars having smoother bodywork. The front wing was lower and wider than in 2008. The rear wing was higher and narrower. The FIA released preliminary technical regulations for the 2009 season on 22 December 2006, and were revised several times to accommodate the findings of the Overtaking Working Group (formed in response to concerns that passing in wheel-to-wheel racing was becoming increasingly rare) and the increasing need for cost-cutting in the sport in the wake of the economic crisis. Slick tyres returned for the first time since they were banned for the 1998 season. Bridgestone continued to be the sole supplier of tyres, and drivers still had to use both compounds of tyre during a race. Soft tyres were differentiated by a green marking around the sides of the tyres, rather than a white marking in a groove as used in 2008. Further, wet tyres were renamed "intermediate" and extreme-weather tyres were renamed "wet". The aerodynamic regulations were radically altered for the 2009 season. The front wings were made lower and wider, while rear wings were changed to be higher and narrower. 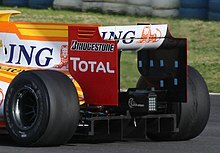 As well as the changes in the dimensions of the wings, bodywork became much more regulated with many of the additional components seen in previous seasons (including barge boards, winglets and turning vanes) removed, making 2009 cars noticeably different in appearance than in previous years. The diffuser at the rear of the car was moved back and upwards. Many other minor chassis components were also standardised. The aim of the new aerodynamic regulations, as well as the reintroduction of slick tyres, was to decrease reliance on aerodynamic downforce and increase mechanical grip with the aim of making wheel-to-wheel racing easier. For the first time, cars were allowed to use driver adjustable bodywork, in the form of adjustable flaps in the front wing. The flaps could be adjusted by up to six degrees, limited to only two adjustments per lap. Adjustable front wings were designed to improve downforce when following another car, another change designed to improve overtaking. Kinetic Energy Recovery Systems, a regenerative braking device designed to recover some of the vehicle's kinetic energy normally dissipated as heat during braking, were introduced for the 2009 season. The recovered energy can be stored electrically, in a battery or supercapacitor, or mechanically, in a flywheel, for use as a source of additional accelerative power at the driver's discretion by way of a boost button on the steering wheel. The regulations limit the additional power to around 82 hp (61 kW) of 400kJ for six seconds a lap. The systems were not made compulsory, and because of concerns about both limited performance gains and safety implications only four teams opted to use the system during the season. While the FIA were planning on introducing a budget cap to limit the amount of spending by Formula One teams in 2008, the amount was not agreed upon and the budget cap idea was dropped. Instead, costs were brought down by a complete ban on in-season testing, a forced reduction in wind tunnel usage, the sharing of more data during race weekends, an increased minimum engine lifespan and gearboxes had to last for four races, and a penalty of five places in the starting grid was applied, should a driver change it during the weekend before the start of the race. Each driver was limited to a maximum of eight engines throughout the season, in addition to four engines for practice/testing purposes; using additional engines resulted in a 10-place grid penalty for each additional engine used. To aid improvements in reliability, the engines were detuned from 19,000 RPM to 18,000 rpm. The rule stating that the pit lane is closed during a Safety Car period was scrapped in 2009. The rule was introduced in 2007 to prevent drivers rushing back to the pits to refuel, possibly speeding through a danger zone, but software was successfully developed to solve this problem. The pit lane speed limit was also increased from 50 mph (80 km/h) to 62 mph (100 km/h). The FIA initially declared that the driver with the most wins at the end of the season would be the winner of the 2009 Formula One World Championship, but dropped the decision because of opposition from teams and drivers. Formula One Teams Association argued that FIA could not change the rules this close to the season's start without the full agreement of the teams. Other proposals rejected by FIA were the introduction of a new points system with the scale 12–9–7–5–4–3–2–1 and to award medals for first, second and third place. FIA President Max Mosley announced dramatic rule changes for the 2009 season in a bid to improve the spectacle of the sport, with the cars undergoing major changes in an effort to increase overtaking. The design changes significantly altered the design of the cars, incorporating wider and lower front wings, taller and narrower rear wings, and a reduction on aerodynamic bodywork. Also introduced were slick tyres and Kinetic Energy Recovery Systems, as well as implementing cost-cutting measures in a response to the rising costs of competing. Honda announced in December 2008 they would be leaving Formula One with immediate effect, as a result of the automotive industry crisis. After a winter of uncertainty, it was confirmed on 5 March 2009 that the team would compete in the 2009 season as Brawn GP, with Mercedes engines, following a management buyout led by team principal Ross Brawn, and would retain the services of both Jenson Button and Rubens Barrichello as drivers. Anthony Davidson, who competed for the Honda-backed Super Aguri team before their early withdrawal in 2008, joined Brawn as a test driver. Force India joined Brawn GP in using the Mercedes engines by signing a five-year deal until 2013, having ended their previous supply contract from Ferrari. The retirement of Red Bull Racing driver David Coulthard led to the appointment of Sebastian Vettel as his replacement, who left the Scuderia Toro Rosso team after a successful previous season including winning the Italian Grand Prix. Toro Rosso, a team designed to develop new Formula One drivers, saw co-owner Gerhard Berger sell his half-stake back to Red Bull, claiming that the new regulations would "leave no room for improvement for a small team like STR", Franz Tost took over as team boss. Filling Vettel's race seat in Toro Rosso was Sébastien Buemi, who as part of the Red Bull Junior Team competed for Trust Team Arden in the GP2 Series. The Drivers' World Championship would be decided in the traditional manner of points scored after Bernie Ecclestone's idea that the driver who won the most races be declared as the champion was scrapped following protests from the Formula One Teams Association. The teams were less successful in their attempts to have the long-running French and Canadian Grands Prix kept on the calendar, with the organisers of both events pulling out due to financial issues. The Abu Dhabi Grand Prix made its début appearance as the last round of the season, at the Hermann Tilke-designed Yas Marina Circuit. The race, starting at sunset, was Formula One's first day-night race. The first multi-team testing session took place at Circuit de Catalunya, Barcelona in November 2008, two weeks after the end of previous season. All teams, except Toyota, took part in the testing session where some teams tested their new aerodynamics package and slick tyres. The new look cars did not suit everyone's taste, with BMW Sauber's test driver, Christian Klien, labelling the car the ugliest car he'd ever seen. On 9 March, testing at Barcelona featured for the first time Brawn GP, who made an immediate impact by leading the times early in the day. The test, the first in which all teams used their 2009 cars, had BMW Sauber leading the times while Brawn GP finished fourth. On day three, Brawn GP's Jenson Button was fastest by just over one second to Ferrari's Felipe Massa, while Button's teammate Rubens Barrichello went even faster the next day. At the other end of the timing sheets, reigning Champion Lewis Hamilton's McLaren team were struggling to adapt to the new regulations, often 1.5 seconds off the pace. Massa stated he had never seen McLaren so far behind. A major source of controversy throughout the winter season were the rear diffusers. Three teams – Toyota, Williams and Brawn GP – launched their cars with a diffuser that uses the rear crash structure in order to generate additional downforce, labelled "double diffusers". These designs were quickly protested, and just days after the cars were unveiled, rival teams asked the FIA for a clarification on the matter. On the Wednesday of the season opening race in Australia, an official complaint was launched by the seven other teams against the rear diffusers of the Williams FW31, Toyota TF109 and the Brawn BGP 001 saying that they were illegal. The FIA scrutineers disagreed, declaring the cars legal. The other six teams filed an unsuccessful appeal which was heard on 14 April 2009 – the week prior to round three of the championship, the Chinese Grand Prix. Button won in Australia giving the newly formed Brawn GP their first win on their début; he subsequently won five of the six following races; and then he didn't win any of the remaining ten races of the season. The season opened at the Australian Grand Prix, won by Jenson Button with teammate Rubens Barrichello in second, giving the team a 1–2 on its début. Red Bull's Sebastian Vettel had been running in second until he collided with BMW Sauber's Robert Kubica. The accident meant the race finished behind the safety car, with Toyota's Jarno Trulli eventually classified third despite McLaren's false protest he had illegally overtaken Lewis Hamilton. Reigning champion Hamilton was disqualified from the Australian race for lying to the stewards and at the following Malaysian Grand Prix there were reports he was on the verge of quitting. The race was equally dramatic, being stopped because of monsoon-like conditions, meaning only half points were awarded for only the fifth time in F1 history. Button mastered the changing conditions for his second win, while quick starting Nico Rosberg dropped to eighth when the race was stopped. In the interval between races, the controversial double diffusers, used by Brawn, Williams and Toyota, were declared legal by the FIA, ending the fight over their use. The Chinese race also took place in wet conditions, with the rain throughout the duration of the race necessitating a safety car start and causing several accidents. Vettel led teammate Mark Webber to Red Bull's first win in Formula One, ahead of the two Brawns and McLarens. Dry conditions at Bahrain saw the Toyota team gain the front of the grid, but Button managed to fight up from a fourth-place start, and overtook race leader Timo Glock on his first pit stop. Hamilton and Räikkönen, in fourth and sixth respectively, gave their 2008 championship winning teams the best finishes of a disappointing season start. The Spanish Grand Prix was a battle between the Brawn teammates, with Barrichello getting ahead of polesitter Button while a first lap incident forced the retirement of four drivers. Button followed a different pit-stop strategy and passed Barrichello during his stop, leading Brawn's second one-two of the season. Red Bull was the closest team to Brawn finishing third and fourth, while Felipe Massa's fuel shortage lost him places as he slowed to finish the race. Button won in dominant fashion at Monaco, leading the majority of the race from pole position ahead of his teammate Barrichello and Räikkönen, who scored Ferrari's first podium in 2009. At the Turkish Grand Prix Vettel started on pole but lost the position to Button on the first lap. Button went on to win, followed by Webber and a closely pursuing Vettel. Barrichello's car developed a gearbox problem, and incidents with Heikki Kovalainen and Adrian Sutil resulted in Brawn's first retirement of the season. By winning six out of the first seven races, Button had opened up a 26-point lead on his teammate, with Vettel a further six points behind. Red Bull and their drivers reduced the respective championship leads of Jenson Button and Brawn GP during the mid part of the season. The British Grand Prix was seen as a turning point, being dominated by Red Bull with Vettel leading home Webber, in dry conditions. Button was not on the podium for the first time this season, finishing sixth. Red Bull also dominated the following German Grand Prix with Webber taking his first pole and race win, despite being given a drive through penalty. Ferrari were also showing signs of improvement, Felipe Massa finishing third in what would be his final race of the season. He was hospitalised after being hit on the helmet by a flying spring when he was travelling at 162 mph in qualifying for the Hungarian Grand Prix. The accident overshadowed the race, with a lightly-fueled Fernando Alonso on pole retiring early in the race, which was won by Lewis Hamilton. Jaime Alguersuari finished his début race ahead of Buemi, the Toro Rosso test driver replacing the fired Sébastien Bourdais. Post-race, the Renault team received a suspension for the European Grand Prix, for an incident where Alonso's tyre came loose on the race track following a pit-stop error. An appeal overturned the decision, and the team raced in Valencia. During the summer break, BMW Sauber announced their withdrawal from Formula One racing due to poor results and lack of financial sustainability. The team would compete until the end of the season, while BMW attempted to sell the organisation. Seven-time champion Michael Schumacher was originally set to replace the injured Massa, but the seat was taken by test driver Luca Badoer due to Schumacher's neck injuries. Also replaced was Renault driver Nelson Piquet Jr., who complained of unfair treatment by team management, in favour of GP2 driver Romain Grosjean. Force India and McLaren both came from the midfield to the points in 2009. The European Grand Prix in Valencia provided the first win for Rubens Barrichello after Hamilton lost the lead with an error in the pits; he finished second while both Red Bulls failed to score. At the Belgian Grand Prix Giancarlo Fisichella gained Force India's first pole position, and his second-place finish behind Kimi Räikkönen gave their first points. Button's title charge was undermined by poor qualifying and a crash, involving him, Hamilton, Alguersuari and Grosjean, ending their races. Following the race Badoer, who had qualified and finished last in both races, was replaced with Giancarlo Fisichella after his performance at the Belgian race. Vitantonio Liuzzi in turn took the vacant Force India drive. Brawn returned to form in Italy, with Barrichello leading home the team's fourth 1–2 of the season. Lewis Hamilton crashed on the penultimate lap, but came back by winning the next race at Singapore. Webber's crash ended his chance of winning the championship. Vettel kept the opportunity of winning the Drivers' title with a dominant display in the Japanese Grand Prix, with Toyota's Trulli gaining what would prove to be Toyota's final podium before their withdrawal at the end of the season. Toyota teammate Glock was injured during qualifying, and a cracked vertebra meant he was replaced by reserve Kamui Kobayashi for the final two races. The Drivers' and Constructors' Championships were both decided at the penultimate race in Brazil. Storm affected qualifying at Interlagos gave Barrichello pole during Formula One's longest qualifying session, while title-rivals Button and Vettel started from 14th and 16th respectively. During the first lap, three incidents led to the retirement of three cars and a fire in the pit-lane, with Button taking advantage to move up the grid. Button fought up to fifth position by the race end, securing enough points to clinch the title. Mark Webber took the lead after Barrichello pitted and won the race, followed by Robert Kubica, to give BMW Sauber their joint best result of their final season and his only podium result in 2009. Lewis Hamilton completed the top three after starting 17th on the grid, moving him and McLaren above Kimi Räikkönen and Ferrari respectively in the Championships. The inaugural Abu Dhabi Grand Prix, taking place at sunset, rounded out the season, with another win for Vettel and Red Bull's fourth 1–2 result of the year, awarding Vettel and the team second place in both championships. In a scandal dubbed "Crashgate" by the media, allegations of race-fixing during the 2008 Singapore Grand Prix emerged during the second half of the 2009 season from former Renault driver Nelson Piquet Jr. Over the course of the 2009 Belgian Grand Prix, Piquet, who had been sacked weeks earlier by Renault, claimed he was asked to crash at the Singapore race in a strategy designed to aid teammate and eventual race winner Fernando Alonso. Renault were handed a two-year suspended ban from the sport after the FIA World Motor Sport Council decided the team's managing director, Flavio Briatore and its executive director of engineering, Pat Symonds had asked Piquet to crash. Both had left the team before the WMSC hearing, where they were given life and five-year suspensions respectively. It had been rumoured Renault were prepared to quit the sport at the end of the 2009 season had the team been heavily punished, but the FIA found Briatore and Symonds solely to blame and chose to suspend Renault's ban. Points were awarded to the top eight classified finishers. If two or more competitors had the same number of points (including 0 points), their positions in the Championship were fixed according to the quality of their places. Under this system one first place was better than any number of second places, one second place was better than any number of third places, and so on. – Half points were awarded at the Malaysian Grand Prix as less than 75% of the scheduled distance was completed due to heavy rain. – Half points were awarded at the Malaysian Grand Prix as less than 75% of the scheduled distance was completed. ^ a b "Brawn win title in debut F1 year". BBC Sport. BBC. 18 October 2009. Archived from the original on 21 October 2009. Retrieved 1 November 2009. ^ "Great Button!". Sky Sports. British Sky Broadcasting. 18 October 2009. Archived from the original on 20 October 2009. Retrieved 19 October 2009. ^ "Newey: Biggest rule changes since 1983". planet-F1.com. 9 February 2009. Archived from the original on 12 February 2009. Retrieved 20 July 2010. ^ a b c d e f g "FIA revises final 2009 entry list". Autosport.com. Haymarket Publications. 26 March 2009. Archived from the original on 29 March 2009. Retrieved 26 March 2009. ^ "McLaren extend Hamilton's contract". Autosport.com. Haymarket Publications. 18 January 2008. Retrieved 17 March 2009. ^ "McLaren confirm Kovalainen for 2009". Autosport.com. Haymarket Publications. 31 July 2008. Archived from the original on 5 August 2008. Retrieved 31 July 2008. ^ "Massa to stay at Ferrari through 2010". Autosport.com. Haymarket Publications. 16 October 2007. Archived from the original on 22 June 2009. Retrieved 17 March 2009. ^ "Badoer to replace Massa at Valencia". Autosport.com. Haymarket Publications. 11 August 2009. Archived from the original on 14 August 2009. Retrieved 11 August 2009. ^ a b Noble, Jonathan (3 September 2009). "Force India releases Fisichella to Ferrari". Autosport.com. Haymarket Publications. Archived from the original on 7 September 2009. Retrieved 3 September 2009. ^ "Ferrari confirm Raikkonen to end of 2010". Formula1.com. Formula One Administration. 12 September 2008. Archived from the original on 22 June 2009. Retrieved 12 September 2008. ^ a b "Kubica and Heidfeld stay with BMW". BBC Sport. BBC. 6 October 2008. Retrieved 1 January 2010. ^ "ING ends Renault deal immediately". Autosport. 24 September 2009. Retrieved 24 September 2009. ^ "Romain Grosjean to race for Renault". Formula1.com. Formula One Administration. 18 August 2009. Archived from the original on 26 November 2009. Retrieved 1 November 2009. ^ "Trulli signs new Toyota contract". BBC Sport. BBC. 28 July 2006. Retrieved 20 October 2006. ^ "Kobayashi stays on as Toyota reserve". Autosport.com. Haymarket Publications. 15 January 2009. Archived from the original on 7 February 2009. Retrieved 15 January 2009. ^ "Toyota to retain Glock for 2009". ITV-F1.com. ITV. 4 August 2008. Archived from the original on 5 August 2008. Retrieved 4 August 2008. ^ "Timo Glock to miss Brazilian Grand Prix". Toyota F1 official website. 11 October 2009. Archived from the original on 13 March 2012. Retrieved 11 October 2009. ^ Beer, Matt (6 February 2009). "Bourdais confirmed at Toro Rosso". Autosport.com. Haymarket Publications. Archived from the original on 7 February 2009. Retrieved 6 February 2009. ^ "Alguersuari joins Toro Rosso team". BBC Sport. BBC. 20 July 2009. Archived from the original on 20 July 2009. Retrieved 20 July 2009. ^ a b "Toro Rosso confirm Buemi for 2009". Autosport.com. Haymarket Publications. 9 January 2009. Archived from the original on 16 January 2009. Retrieved 9 January 2009. ^ "Red Bull extend Webber's contract". Autosport.com. Haymarket Publications. 3 July 2008. Archived from the original on 27 April 2009. Retrieved 17 March 2009. 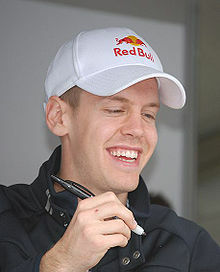 ^ "Sebastian Vettel to join Red Bull for 2009". Formula1.com. Formula One Administration. 17 July 2008. Archived from the original on 20 November 2008. Retrieved 17 July 2008. ^ a b "Williams names unchanged line-up for '09". crash.net. 1 October 2008. Retrieved 1 October 2008. ^ "Here's Tonio!". GrandPrix.com. Inside F1. 7 September 2009. Retrieved 7 September 2009. ^ "World Motor Sport Council – Decisions". Fédération Internationale de l'Automobile. 5 November 2008. Archived from the original on 21 June 2011. Retrieved 23 June 2011. ^ "2009 FIA Formula One World Championship – Circuit and Lap Information". Fédération Internationale de l'Automobile. 27 January 2009. Archived from the original on 3 March 2009. Retrieved 17 March 2009. ^ "FIA Formula One 2009 Technical Regulations" (PDF). FIA. 11 July 2008. ^ "Top teams pass notes to improve overtaking". formula1.com. Formula One Administration Ltd. 3 October 2008. Archived from the original on 8 January 2010. Retrieved 28 January 2011. ^ "FIA confirms cost-cutting plans". formula1.com. Formula One Administration Ltd. 12 December 2008. Archived from the original on 21 June 2009. Retrieved 28 January 2010. ^ "Bridgestone eyeing slick warm-up cure". Autosport.com. Haymarket Publications. 27 March 2008. Archived from the original on 20 April 2008. Retrieved 27 March 2008. ^ "Bridgestone to use green markings". Autosport.com. Haymarket Publications. 26 February 2009. Archived from the original on 1 March 2009. Retrieved 26 February 2009. ^ a b "World Motor Sport Council – Decisions". FIA. 17 March 2009. Archived from the original on 22 June 2009. Retrieved 17 March 2009. ^ a b c d "2009 F1 Season technical preview". Racecar Engineering. 24 February 2009. Retrieved 28 January 2011. ^ a b Cheese, Caroline (4 March 2009). "F1 ready for racing revolution". BBC Sport. BBC. Archived from the original on 10 March 2009. Retrieved 29 January 2011. ^ a b "The basics of F1 KERS". Racecar Engineering. 14 April 2009. Retrieved 29 January 2011. ^ "2009 Budget Cap". ITV-F1.com. ITV. 19 January 2008. Archived from the original on 17 January 2010. Retrieved 19 January 2008. ^ a b "A beginner's guide to the 2009 rule changes". Formula1.com. Formula One Administration Ltd. 27 November 2008. Archived from the original on 16 June 2009. Retrieved 29 January 2011. ^ "FIA confirms new safety car rules". Autosport.com. Haymarket Publications. 27 January 2009. Archived from the original on 3 February 2009. Retrieved 27 January 2009. ^ "F1 delays controversial new rule changes". cnn.com. 20 March 2009. Archived from the original on 22 March 2009. Retrieved 20 March 2009. ^ Noble, Jonathan (24 March 2009). "FIA confirms points system unchanged". Autosport.com. Haymarket Publications. Archived from the original on 26 March 2009. Retrieved 24 March 2009. ^ a b Elizalde, Pablo (17 March 2009). "Wins to decide world champion in 2009". Autosport.com. Haymarket Publications. Archived from the original on 20 March 2009. Retrieved 17 March 2009. ^ "FOTA say point change is invalid". ITV-F1.com. 20 March 2009. Archived from the original on 22 March 2009. Retrieved 20 March 2009. ^ "Global crisis ends Honda F1 dream?". BBC Sport. BBC. 5 December 2008. Archived from the original on 5 December 2008. Retrieved 5 December 2008. ^ "Honda confirm immediate F1 pull out". Autosport.com. Haymarket Publications. 5 December 2008. Archived from the original on 6 December 2008. Retrieved 5 December 2008. ^ "Honda team to return as Brawn GP". BBC Sport. BBC. 6 March 2009. Archived from the original on 8 March 2009. Retrieved 6 March 2009. ^ "Brawn GP takes over Honda Racing". Autosport.com. Haymarket Publications. 5 March 2009. Archived from the original on 9 March 2009. Retrieved 6 March 2009. ^ "Force India confirm Mercedes deal". Autosport.com. Haymarket Publications. 8 November 2008. Retrieved 8 November 2008. ^ "Sebastian Vettel to join Red Bull for 2009". Formula1.com. Formula One Administration. 17 July 2008. Archived from the original on 3 September 2009. Retrieved 20 June 2011. ^ "Berger: Toro Rosso will lose ground". Autosport.com. Haymarket Publications. 26 November 2008. Retrieved 9 April 2011. ^ "Grand Prix de France – Formule 1 : 28 juin 2009". Gpfrancef1.com. Archived from the original on 27 October 2009. Retrieved 1 November 2009. ^ Pablo Elizalde (15 October 2008). "FFSA cancels 2009 French Grand Prix". Autosport.com. Haymarket Publications. Archived from the original on 17 October 2008. Retrieved 15 October 2008. ^ "FIA issue revised 2009 Formula One calendar". formula1.com. Formula One Administration. 8 October 2008. Archived from the original on 10 October 2008. Retrieved 8 October 2008. ^ "French federation cancels 2009 French Grand Prix for economic reasons". International Herald Tribune. 16 October 2008. Archived from the original on 7 December 2008. Retrieved 22 October 2008. ^ "Abu Dhabi gets Grand Prix for 2009". Formula1.com. Formula One Administration. 3 February 2007. Archived from the original on 15 October 2007. Retrieved 3 February 2007. ^ "Abu Dhabi to be first day-night Grand Prix". ITV-F1.com. ITV. 28 August 2009. Archived from the original on 30 August 2009. Retrieved 28 August 2009. ^ "Barcelona test heralds start of 2009 season". formula1.com. Formula One Administration. 17 November 2008. Archived from the original on 5 December 2008. Retrieved 22 November 2008. ^ "Sato goes quickest in Barcelona test". Autosport.com. Haymarket Publications. 17 November 2008. Archived from the original on 4 December 2008. Retrieved 22 November 2008. ^ "Klien: '09 BMW worst looking car ever". Autosport.com. Haymarket Publications. 18 November 2008. Archived from the original on 7 December 2008. Retrieved 30 November 2008. ^ "BMW Sauber lead First day". ITV-F1.com. ITV. 9 March 2009. Archived from the original on 10 March 2009. Retrieved 9 March 2009. ^ "Barcelona day three – Button stuns in Spain". Formula1.com. Formula One Administration. 11 March 2009. Archived from the original on 28 April 2009. Retrieved 22 June 2011. ^ "Q&A with McLaren's Martin Whitmarsh and Norbert Haug". Formula1.com. Formula One Administration. 13 March 2009. Archived from the original on 22 June 2009. Retrieved 29 May 2009. ^ "Massa says McLaren never been so far behind". Reuters UK. Thomson Reuters. 13 March 2009. Retrieved 10 April 2011. ^ "Technical analysis: Diffuser debacle by Craig Scarborough". Autosport.com. Haymarket Publications. Archived from the original on 22 June 2009. Retrieved 29 May 2009. ^ Noble, Jonathan; Straw, Edd (28 January 2009). "Teams to seek diffuser clarification". Autosport.com. Haymarket Publications. Retrieved 9 April 2011. ^ "Protests lodged against three teams". ITV-F1.com. ITV. 26 March 2009. Archived from the original on 30 March 2009. Retrieved 20 July 2010. ^ "Date set for F1 diffuser appeal". BBC Sport. BBC. 28 March 2009. Retrieved 1 January 2010. ^ "FIA sets diffuser appeal date". Formula1.com. Formula One Administration. 28 March 2009. Archived from the original on 22 June 2009. Retrieved 29 May 2009. ^ "Hamilton loses Aussie GP points". BBC Sport. BBC. 2 April 2009. Retrieved 23 October 2009. ^ Hughes, Mark (5 April 2009). "Lewis Hamilton wanted to quit over Melbourne lies". London: The Times. Retrieved 23 October 2009. ^ Gorman, Edward; Lumpur, Kuala (9 April 2009). "Jenson Button storms to second hit with victory at Thunder Road". London: The Times. Retrieved 23 October 2009. ^ "Court rules Button's car is legal". BBC Sport. BBC. 15 April 2009. Archived from the original on 14 April 2009. Retrieved 15 April 2009. ^ "Button makes it three wins from four in Bahrain". Formula1.com. Formula One Administration. 26 April 2009. Archived from the original on 28 December 2009. Retrieved 6 July 2011. ^ Beer, Matt (10 May 2009). "Button leads Brawn 1–2 at Spanish GP". Autosport.com. Haymarket Publications. Archived from the original on 8 June 2011. Retrieved 6 July 2011. ^ Chaney, Sean (7 June 2009). "Brilliant Button on top in Turkey". BBC Sport. British Broadcasting Corporation. Retrieved 27 October 2011. ^ "How it happened". Autosport. Haymarket Publications. 197 (5): 13. 30 July 2009. ^ Cary, Tom (20 July 2009). "Jaime Alguersuari set to become youngest ever Formula One driver". The Daily Telegraph. Telegraph Media Group. Retrieved 3 November 2011. ^ "2009 Hungarian Grand Prix – Document 45" (PDF). Fia.com. Fédération Internationale de l'Automobile. 26 July 2009. Archived from the original (PDF) on 2 August 2009. Retrieved 3 November 2011. ^ English, Steven (17 August 2009). "Renault wins appeal, will race in Valencia". Autosport.com. Haymarket Publications. Retrieved 3 November 2011. ^ Noble, Jonathan (29 July 2009). "BMW will quit F1 at the end of 2009". Autosport.com. Haymarket Publications. Retrieved 4 July 2011. ^ "Schumacher calls off F1 comeback". BBC Sport. BBC. 11 August 2009. Retrieved 19 October 2009. ^ Noble, Jonathan (11 August 2009). "Schumacher cancels F1 comeback". autosport.com. Haymarket Publishers. Archived from the original on 14 August 2009. Retrieved 11 August 2009. ^ "Piquet goes insisting: Flav was my executioner". Crash.net. Crash Media Group. 3 August 2009. Archived from the original on 6 August 2009. Retrieved 3 August 2009. ^ "Romain Grosjean to race for Renault". Formula1.com. Formula One Administration. 18 August 2009. Retrieved 4 November 2011. ^ "Formula One - 2009 Standings". Formula One. Retrieved 20 April 2019. ^ "European GP Race Report". Grandprix.com. Inside F1. 23 November 2009. Retrieved 8 November 2010. ^ Elizalde, Pablo (7 September 2009). "Force India confirms Liuzzi in second car". Autosport.com. Haymarket Publications. Retrieved 5 November 2011. ^ Beer, Matt (11 October 2009). "Glock ruled out of Brazilian Grand Prix and Abu Dhabi Grand Prix". Autosport.com. Archived from the original on 13 October 2009. Retrieved 11 October 2009. ^ "Qualifying – Barrichello rises to the challenge in Brazil". Formula1.com. Formula One Administration. 17 October 2009. Archived from the original on 25 March 2010. Retrieved 7 November 2011. ^ a b Whyatt, Chris (18 October 2009). "Brilliant Button clinches title". BBC Sport. BBC. Archived from the original on 20 October 2009. Retrieved 18 October 2009. ^ Noble, Jonathan. "F1 awaits Renault's race-fixing verdict". autosport.com. Haymarket Publications. Archived from the original on 27 September 2009. Retrieved 24 September 2009. ^ Noble, Jonathan (21 September 2009). "Renault given two-year suspended ban". autosport.com. Haymarket Publications. Retrieved 1 November 2009.